Mumbai – the mega glittering capital city of Maharashtra and the gateway to India from the west, with its glittering Bollywood culture, pastiche of marvellous Art Deco, Gothic Revival and Indo Saracenic styles of architecture, its beckoning seafront and delicious stall food, it's highly functional harbour and more, provides global hospitality for cosmopolitan guests in hospitable hotels in Mumbai. With a hotel near Mumbai international airport providing convenient access to jet-setting passengers and travellers from distant lands, you can be sure of competent and classy hospitality for both leisure and corporate guests. With posh Superior, Business and Premium rooms and uber-luxurious Topaz and Sapphire suites, with luxurious and lavish furnishings and space, as well as modern amenities such as an LCD television for your entertainment, handy tea/coffee maker, writing table and room lighting control, digital safety vault for your valuables and generous mini-bar to keep you satiated, a telephone and daily newspaper, luxurious 24x7 room service keeps you thoroughly pampered always! With its multi-cuisine restaurant providing delicious international fare and the cheerful coffee shop ripe for snacks and coffee while building up camaraderie, for more sophisticated and subtle entertaining and business chats you can avail of the facilities of wines, classic liquor and liqueurs in the snazzy executive bar with its charming wooden interiors resembling those of an English pub! 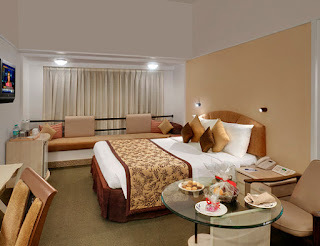 Such hotels in Mumbai and particularly a plush hotel near Mumbai international airport with its airport transfers and travel desk, its day-cleaning service and same day in-house laundry, doctor on call and specially designed toilets for the physically challenged, ensure holistic hospitality for all its valued guests!